Moab's Utah Best Wet Getaways! Sheri Griffith River Expeditions offers two great one day trips on the Colorado River outside of Moab, Utah. Westwater Canyon is fun whitewater with classic Colorado River rapids that we run in Paddleboats when possible. The rapids are rated III-IV, which means they are lots of fun but not crazy. This trip is for those looking to do challenge themselves a little with enjoyable wet whitewater. 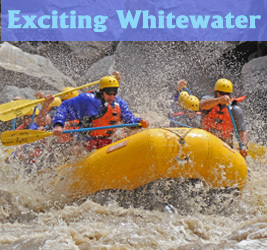 The One Day Westwater Canyon starts farther up the river and is a classic exciting day of whitewater adventure on the Colorado River. This canyon was named "best short whitewater trip in the west" by National Geographic. The Moab One Day Float of the Colorado River is known for its warm river water, majestic beauty with overlooks of Fisher Towers and the La Sal Mountains. 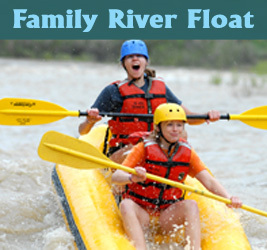 The other one day trip we offer is the Moab Daily Float trip which is a mellow trip with few rapids. This trip is stunningly beautiful, runs along Arches National Park and overlooks the dramatic La Sal Mountains.. The Moab Rafting Float trip is perfect for those that want to relax, swim and enjoy the day.